We hope you enjoyed our Top 10 Albums of 2014 list. As promised, we are dedicating an entire post to the #1 album. 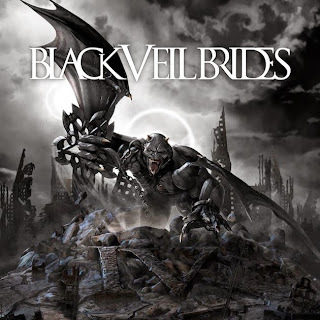 Despite just releasing the awesome Wretched & Divine last year, Black Veil Brides defied the odds and returned with a self-titled album that met and exceeded the high standards that their previously releases had set. With consistently great songs, it is hard to find filler on any of the last few BVB releases, and their latest is no exception. Of course, there are those songs that stand out as anthems on all of their albums. Perhaps their most anthemic song of all, "Goodbye Agony," finds its home on track 4 of this album. Working with Black Album producer extraordinairre, Bob Rock, the Brides have uncorked the bottle of magic that makes heavy music not just great, but iconic. Whether it is the speed of "Heart of Fire," the sing-along magnetism of "Devil in the Mirror," or the headbanging beat of "Faithless," Black Veil Brides have all the metal bases covered on this phenomenal album. This is a band that just doesn't lose momentum and, as a result, they are deserving of the top spot on this year's list.